One simple step a lot of people overlook when finishing a guitar body is masking off the neck pocket and other important areas. While it really isn't necessary it does have benefits. 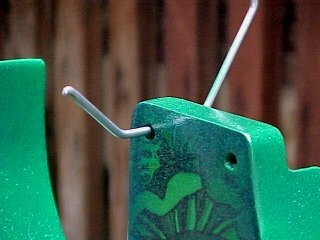 Sprayed paint can build up rather thick especially around the edges, which could effect alignment of your neck during assembly. Another benefit which is cosmetic; when you peel the tape away from the body you will be left with a clean professional-looking finish. One simple tool which you will find yourself making is a hook to hold it up. If you use a wire coat hanger, taking the time to form its shape helps build a convenient tool. Make the hook which fits through the neck screw holes to extend out further. An extended flat bottom "J" which allows painting around the hole without any problems. A shorter hook can actually mask the body from spray otherwise! This also allows you to suspend the body upside down by hooking it through the trem rout. You will find this advantage helpful when painting the bottom of the body. Making your hook long enough to be able to hold on to the top will also allow you more control of the body when painting around it if your working in a limited space. Keeping the design simple on top also allows you to remove it from the area your painting it and hang the body elsewhere to dry, like if you find yourself painting outside and the weather is less than perfect. Ever wonder how to go from a shiny metallic, bright or dark burst edge to the middle and keep relatively the same hue of translucence color on your body? Metallic looking edges are made by applying a silver burst around the body, then painting the entire body in the translucent color of choice. Bright looking edges are made by applying a white burst around the body, then painting the entire body in the translucent color of choice. Medium to dark edges are made by applying a medium to dark gray burst around the body, then painting the entire body in the translucent color of choice. I have had limited experience here but I will tell you of one success story. I used acrylic artist paints which are flexible even when dry to paint the missing part of the pattern found on a Jem FP. It looked pretty cool because it gave the illusion of the pickups disappearing into the body. Painting Tips and Tricks by Brian Calvert is licensed under a Creative Commons Attribution-NonCommercial-ShareAlike 4.0 International License.